Looking for a tattoo design that best represents freedom? You’d be hard-pressed to find anything more perfect than wing tattoos, which are open to a lot of customization. You can even have them in tribal style if you’re into tribal tattoos. Wing tattoos have different variations, though people immediately think of angel wings when talking about wing tattoos. Angel wings symbolize protection and guidance, similar to an angel or guardian angel tattoos. Unlike other wing tattoo designs, angel wings are usually depicted in a folded form, making them an excellent choice for a back tattoo. Wing tattoos can also symbolize duality. For example, if you want a tattoo that represents both the good and bad in you, you can go with a design composed of an angel wing on one side and a devil wing on the other. You can think of this design as an alternative to the yin-yang design, which also represents two sides of a coin, so to speak. You can have this mixed wing tattoo design on both biceps, on the back, or on the chest. You can also get wing tattoos in memory of a lost loved one instead of rose tattoos or cross tattoos. You can have the name of the person flanked by angel wings, perhaps with a short quote somewhere at the top or bottom. Unlike other wing tattoos, this variation works better in small sizes in order to keep it more private. Perseverance is also associated with wing tattoos. People who have gone through particularly difficult times in life look at wing tattoos as a symbol for rising up and leaving the past behind to start anew. This is similar to how phoenix tattoos symbolize rebirth and the beginning of a new era or phase in life. If you want a different take on wing tattoos, you can go for wing tattoos on both ankles. This particular version of wing tattoos represents the Greek god Hermes, the messenger of the gods. In Greek mythology, Hermes is often depicted wearing sandals with small wings. You can imitate this image by having small wings tattooed on the ankles. Hermes also acts as the protector of travelers, so you can think of a Hermes-inspired wing tattoo as a protective charm if you travel a lot. Wing tattoos definitely look best in black-and-gray style. Colored wing tattoos are actually pretty uncommon among men. Some have a few color highlights here and there. But for the most part, wing tattoos come in solid black-and-gray. Perhaps the only time colored wing tattoos look great is when the design is based on bird wings to symbolize freedom. If you prefer colored wing tattoos, we recommend going for phoenix wings, which look marvelous with the right combination of red, yellow, and orange. Of course, you can always go for designs based on other creatures, real or otherwise. In which case, you might want to check out dragon wing tattoos. Dragons usually come in different colors, depending on the source material, so you can go for fully colored dragon wing tattoos if you want. 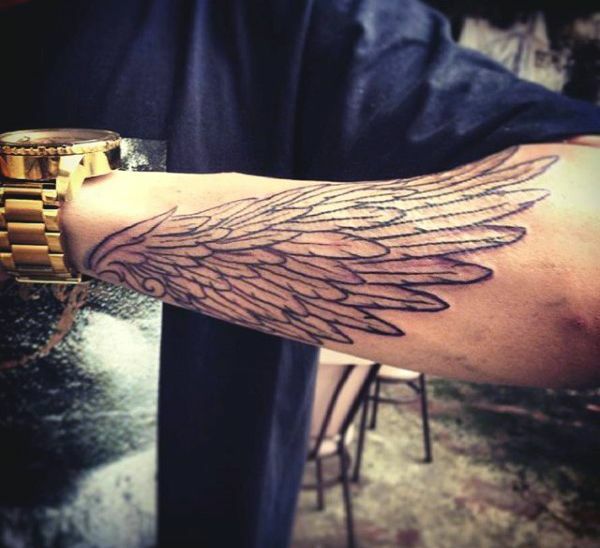 Here are some of the best wing tattoos for men, which you can use as inspiration for your own wing tattoo design.